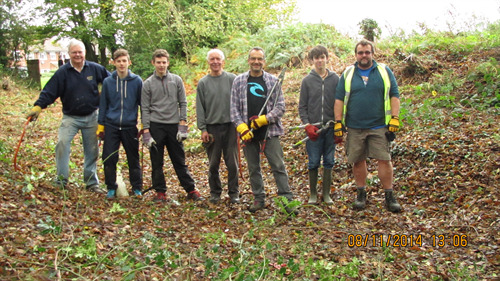 To help maintain our open spaces for the benefit of all, residents have organised themselves into a group of volunteers known as the Wheathampstead Open Spaces Volunteers (WOSV). The group meets regularly at the weekend to work on maintaining the open spaces in accordance with the Open Spaces policy. If you want to learn about open spaces management, creating biodiversity and getting some exercise in the open air all in one go, then please join the group! Please use the menu to the left for more information about each key location. If you wish to participate then you are welcome to turn up at one of the sessions listed in the calendar below, dressed appropriately! If you have any questions, you can contact the lead volunteer, Peter Ryan, by clicking here. Most of our sites have a designated Ranger who monitor the area, advise the council when work is required, help to organise working parties and participate fully in revising and implementing management plans for their site. These activities focus on our environmentally sensitive areas especially local nature reserves and county wildlife sites. They pay attention to wildlife sensitivity. Locations and activities may vary as local conditions change. August 11 East Lane car park riverbank 1. Remove scrub from riverbank.